The title above is from the lyrics of the song All Along the Watchtower, written by Bob Dylan, re-arranged and played by Jimi Hendrix. Jimi Hendrix died on September 18, 1970, 38 years ago today. Close your eyes after you click on the video below, it’s all audio. You’ll hear some of the best guitar music ever recorded. Dave Mason played acoustic rhythm guitar. 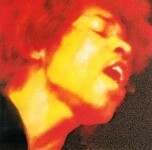 It was recorded in 1968 on the album Electric Ladyland (album cover shown below). Hendrix produced Electric Ladyland with headphones. Check it out with your earbuds.